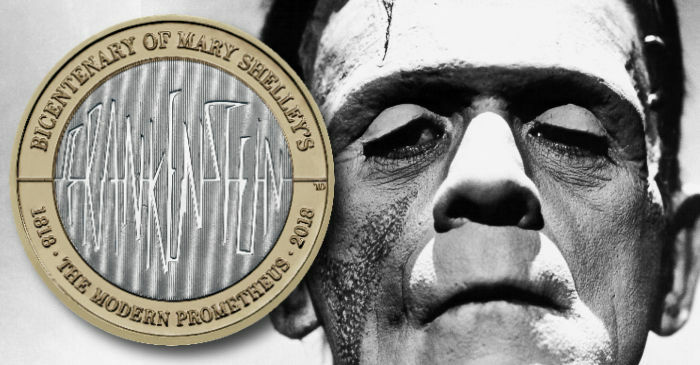 The Royal Mint have unveiled (1st January) the new design of the third commemorative two-pound coin issued in remembrance of the 200th anniversary of the publication of Mary Shelley’s Frankenstein — a work of fiction which was to take the world by storm in terms of originality and imagination. On a stormy night in 1816, a group of friends gathered at a villa on the shores of Lake Geneva to tell each other ghost stories. The company, including the poets Lord Byron and Percy Shelley, had been discussing the latest scientific controversy: Was human life simply biological or did it contain the divine spark of God? That night Mary Godwin, later Mary Shelley (1797-1851) after her marriage to writer Percy Shelly (1792-1822), experienced a fevered dream about the birth of a terrible creature that was to become one of the most famous horror stories ever written. Her anonymously published novel, which went into print on the 1st January 1818, was entitled Frankenstein, or, The Modern Prometheus. It told the story of Victor Frankenstein, a young scientist who creates a grotesque but compassionate creature in an unorthodox scientific experiment. Shelly’s name first appeared on the second edition which was published in France in 1823. The work was also turned into a stage play in 1822 by Richard Brinsley Peake (1792-1847), the dramatist under the title Presumption, or, the Fate of Frankenstein. The story has survived over the years and has been re-told in many countries. It has also become the basis of many stories inspired by the initial premise of the ability to bring the dead back to life. The first motion picture which took on the subject matter was in 1931 and made international stars out of the actors portraying the monster and mad scientist. The reverse side of the coin is designed by Thomas T. Docherty and includes a rendition of the word FRANKENSTEIN in stylised lettering referencing the electrical spark which led to the monster being brought to life. 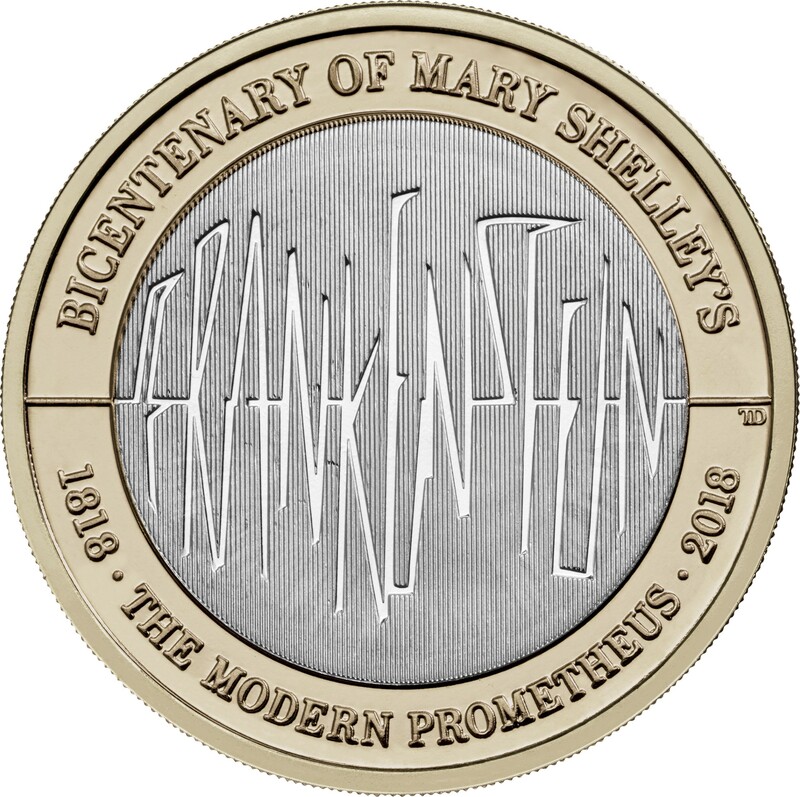 The commemorative text BICENTENARY OF MARY SHELLY’S is placed above the primary centred design with 1818 • THE MODERN PROMETHEUS • 2018 placed below. 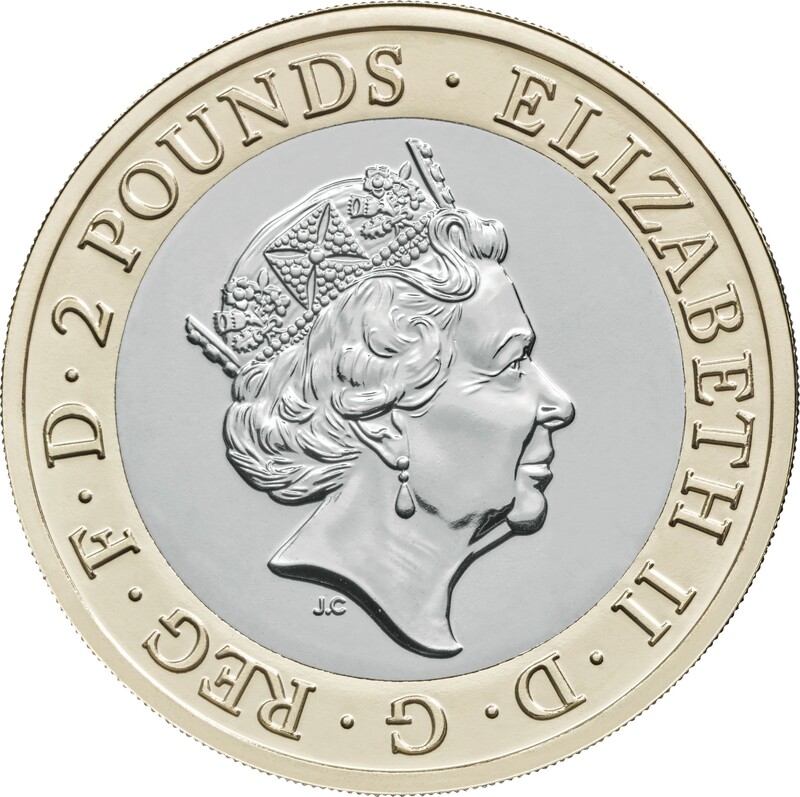 The obverse includes the fifth effigy of HM Queen Elizabeth II designed by Royal Mint Engraver Jody Clark and has been in use on British circulation and commemorative coins since 2015. 2 pounds Bi-metallic 12 g 28.4 mm Brilliant Unc. The two-pound bi-metallic coin will be included in the annual Brilliant Uncirculated mint and Proof sets and will also be available for separate purchase with base metal and precious metal variations. 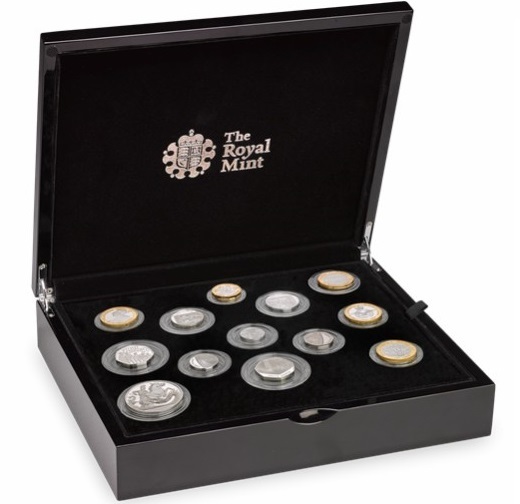 For additional information on these and other coins offered by the Royal Mint, please visit their website. Mint director sent back to trump?